This entry was posted on April 22, 2014 by Heather. It was filed under north bay and was tagged with delicate, Easter, flowers, green, Heather Cote Photography, North Bay, spring, tulip, white. Stunning photo. I also like tulips. I tried to grow some white ones but did not have good luck. It seems the red and yellow ones grow best for me. thank you! I rarely see white ones where I buy them so was very happy to find these…maybe they are not as hardy as the red and yellow? Gorgeous Image, Heather. I agree that tulips droop far too quickly. thank you Bill…the white is so delicate looking to me! Lovely, Tulips are always good subjects. thank you Cindy…yes, I thought the almost b/w was an interesting outcome! Heather, that’s exactly how I feel. Lovely bouquet! 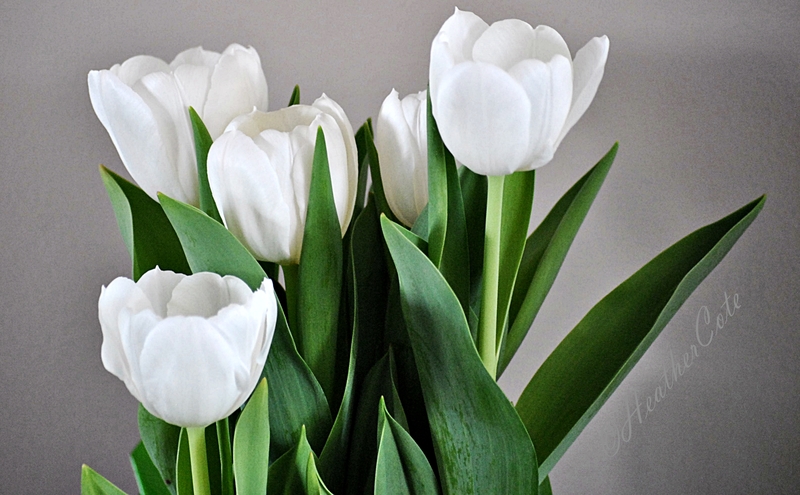 thank you Wendy…I couldn’t resist the white tulips, rarely ever see them! I too love tulips, especially yellow and white. The white contrasts so beautifully against the green leaves. Nice shot!